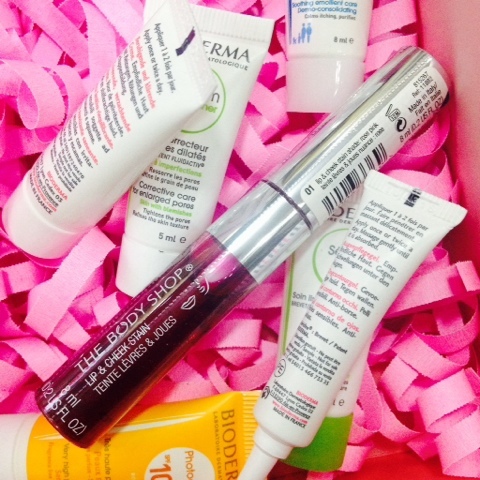 Unboxing the (2015) June BDJ Box: Bare Beautiful Skin* | Vanity and Everything in Between. 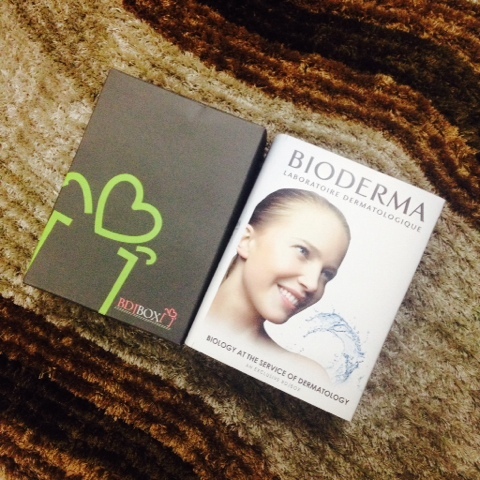 Bioderma was officially launched last year here in Manila. It's a French skin care brand that is very famous for its micellar water solution. Before the brand was officially launched here, you can only get hold of this via online sellers and/or if you travel abroad. Sensibio Eye Gel Counter Gel (15ml, PhP1,248) - restore the youthful brightness of your sensitive eye area with this gel. The lightweight hydrating gel works to decongest this most delicate area of our skin, reducing puffiness and smoothing fine lines with its rigorously selective active ingredients. Immediately, eye skin is soothed and protected, and becomes resistant to external attack thanks to the patented Toléridine* complex. 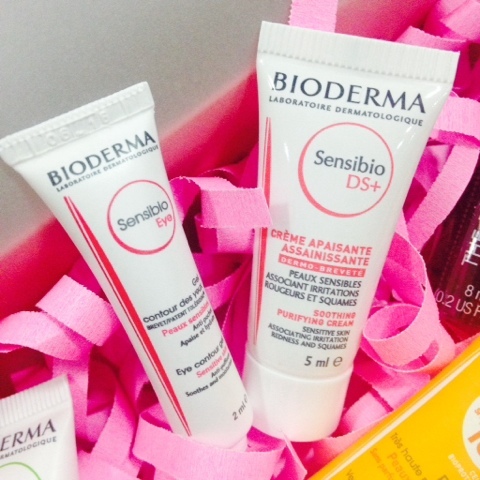 Sensibio DS+ (PhP40ml, PhP1,628) - this is an intensely calming moisturiser with a lightweight texture. Designed for those who have sebhorrhoeic dermatitis, its soothing formula works to relieve high colour and smooth the skin using a dual anti-fungal anti-flammaory action. It uses a targeted action to boost the skin's healing process, while the patented natural D.A.F complex improves the skin's tolerance threshold. Its pleasant, non-oily gel-cream texture provides instant comfort. Atoderm Gel Moussant (200ml, PhP1,238) - the gentle, soap-free formula can be used on the face and other imperfection-prone areas of the body, such as the chest and the back. The non-comedogenic was reduces sebum secretion with its patented Fluidactiv* sebum-correcting complex, and ensures that the sebum is of better quality to reduce the risk of breakouts. 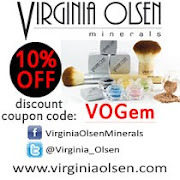 After use, skin is left feeling purified and fresh. Atoderm Intensive (200ml, PhP1,418) - when skin is atopic and dry, it can be extremely irritable, itchy and uncomfortable. The Intensive Soothing Emollient Care is created with Bioderma's exclusive Skin Barrier Therapy* complex which restores the integrity of the skin barrier, prevents the penetration of allergens and enhances suppleness and comfort. Added Zinc and Betasitosterol provide intense anti-inflammatory care and helps to stop the itch. Atoderm Cream (200ml, PhP1,598) - moistens the skin with anti-dehydrating agents which hold water in the upper layers of the skin and stops it from evaporating. Photoder Max (40ml, PhP1,348) - with maximum anti-UVB and extreme anti-UVA performance, it guarantees optimum protection against sunburn, sun intolerance and premature ageing. Sebium Pore Refiner (30ml, PhP1,468) - tighten pores that are dilated, prevent imperfections, and mattify the skin both immediately and over the long term. The light-weight fluid formula melts into skin instantly and creates an excellent base for makeup application. Sebium AKN (30ml, PhP1,038) - this non-comedogenic treatment cleanses the pores in depth while slowing the overproduction of sebum. It also smoothes the skin's texture over time, ensuring that it looks clear and more uniform. The light texture is rapidly absorbed and makes a great makeup base. The Body Shop Lip and Cheek Stain (8ml, PhP795) - give your lips and cheeks a healthy-looking glow with one wash of colour or builds up for a richer, deeper coverage. Another box that I love! As you all know, my clear skin got pimples and acne all over as a reaction to a new skin care earlier this month. I stopped using it after two weeks and went back to using Avene until I got clear skin again. 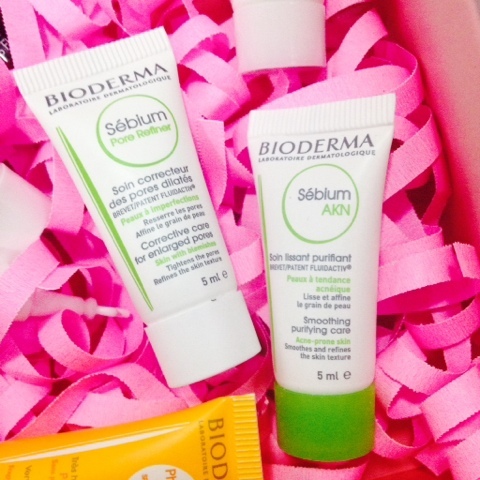 I have a 3 full size products from the Sebium line and its micellar water solution. 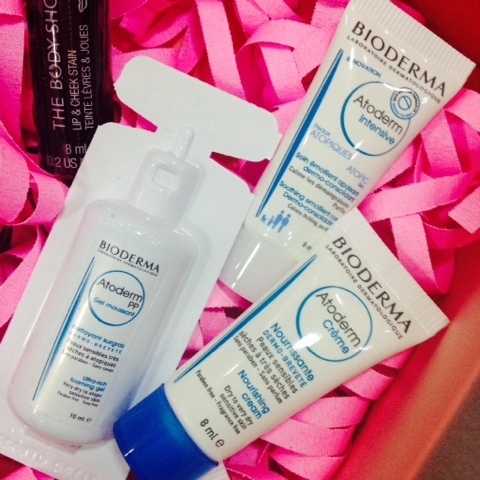 This month's BDJ Box is a clear signal that I should finally use my Bioderma products come July 1st. Haha! I was postponing it for the BER month but this box got me all excited! Will probably start using these deluxe size products since I don't think I'll be travelling out of the country anytime soon. As for the lip and cheek tint, it's one of the first makeup products I've tried when I was young. It was the only kind of product my mom really allowed me to use back in middle school. I hope it's still the same consistency as before! 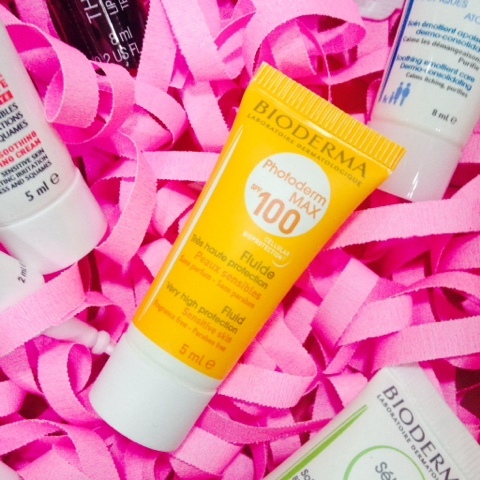 Bioderma is a tad expensive compared to other skin care products that we see at SM Beauty but you know what they say, everything starts with having a good base. I know I haven't fully convinced myself in buying expensive skincare products but I have a few expensive stash of skin care and one of them is Bioderma. I like they micellar water because it's gentle but does the job. So if you were able to get this month's subscription, you're very happy for sure! I can't share these with L but I'm sure he doesn't mind. LOL! If you want to have your own BDJ Box, you can visit their website at www.bdjbox.com and subscribe! Each box costs only PhP580 but you'll always get more than what you pay for. Hurry cos their boxes sell like hot pancakes! Wow! 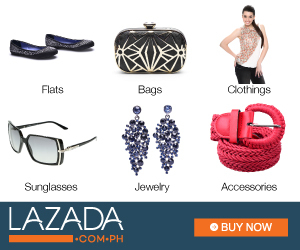 Lahat ng items sa box mukhang effective. Siguro ako, una kong susubukan yun Sebium Pore Refiner at Sebium AKN. Sobrang oily kasi ng t-zone ko. Hindi ko afford ngayon 'to pero kung magsu-subscribe ako sa subscription box, siguradong BDJ box yun! 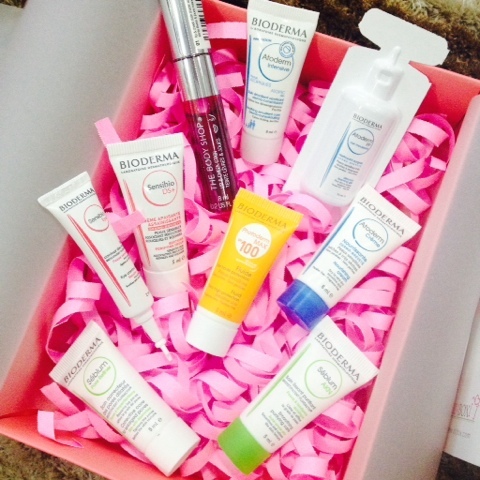 Gusto ko tong BDJ Box na to, coz I'm after on skincare lately. Atleast before buying the pricey full size one may trial muna. Sadly, di nakaabot sa BDJ Box ng June. Super excited ako sa elite boxes nila. Have you tried some from their line? Mild ba like Cetaphil at Physiogel? May nabasa kasi ako mostly ni rerecommend to sa mga clinic.